As I mentioned on Tuesday and Wednesday, Chris was off from last Thursday to Monday because of the holiday. We decided to take advantage of his time off and do a lot of fun activities with Noah. On Saturday, we took Noah to his first Home Depot Kids Workshop! 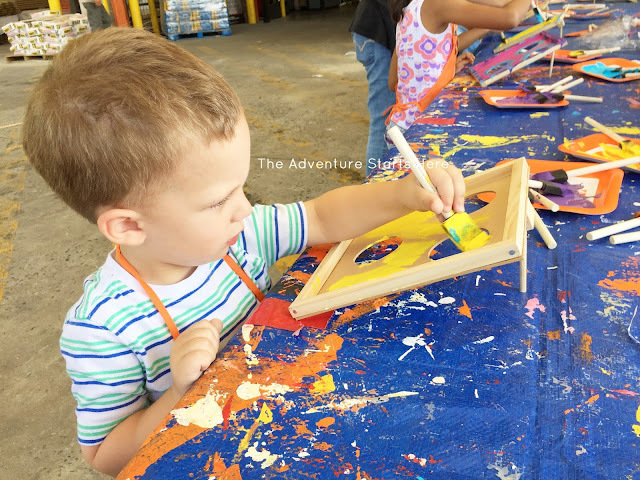 I became interested in the idea after seeing Liz's post about Mason going to the Lowe's Build and Grow. 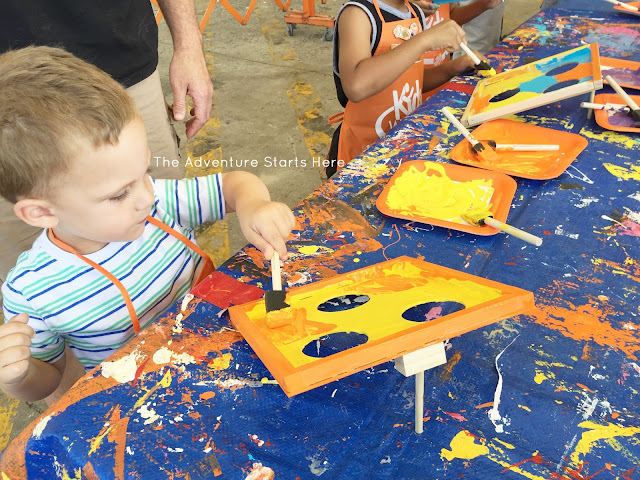 When I mentioned it to Chris, he thought it was a great idea and really wanted to do it with Noah. 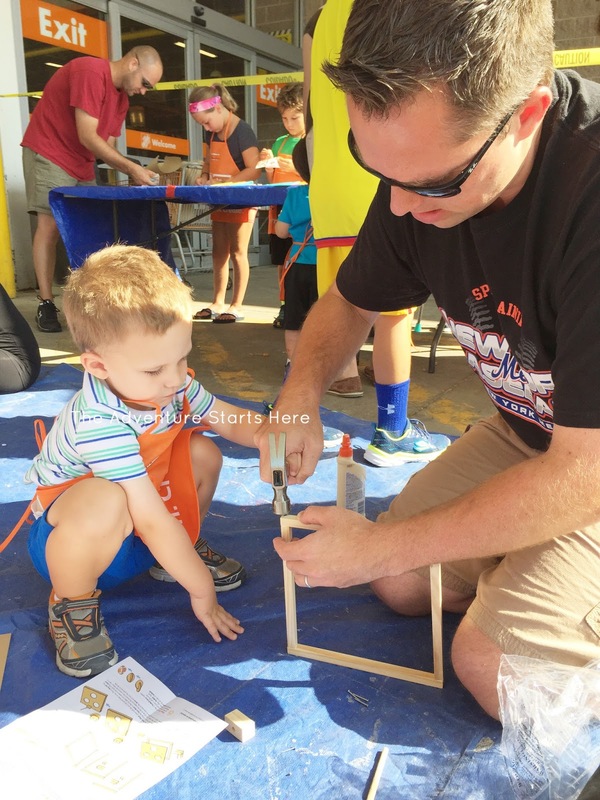 Home Depot hosts these Kids Workshops the first Saturday of each month. As soon as we decided we wanted to do it, it seemed like we were busy the first Saturday of EVERY MONTH! Then a few weeks ago, a friend of mine sent me the link and asked if we'd be interested in going! Thankfully, we were free this time and immediately registered online. Liz had mentioned that these things fill up fast, so we didn't want to take any chances. I later found out it really wasn't necessary (at least at the Home Depot in our town) to even register and you can stop by anytime between 9 and 12 with no problem. We ended up getting there around 10 and Chris and Noah got right to work with building a "football toss game". Chris read the instructions to Noah and Noah helped with each step... hammering, gluing, and finally painting the whole thing! He was very interested in the entire process and really seemed to love it. 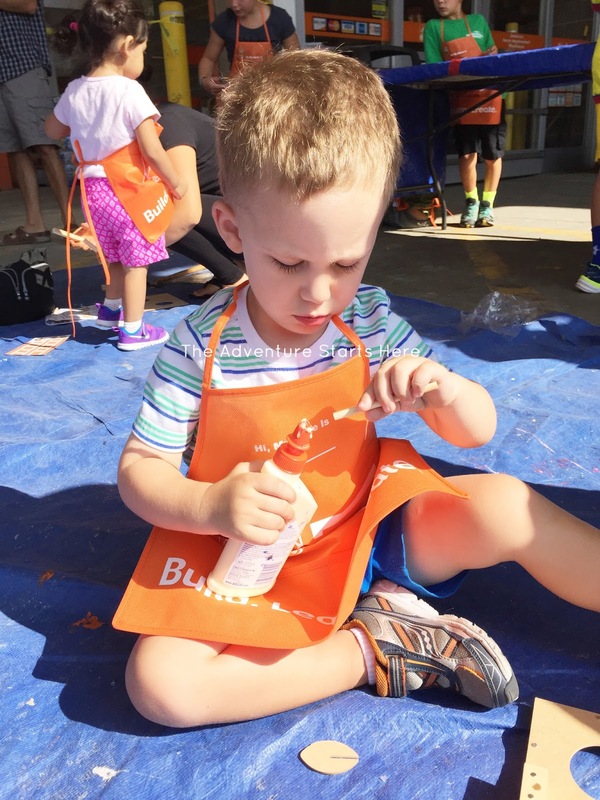 Each child got a Home Depot apron with their name written on it. They also get a pin (with a picture of the craft on it) each time they come and participate in the workshop. We saw one girl with probably 30 pins on her apron! We had so much fun and definitely plan to go back next month. 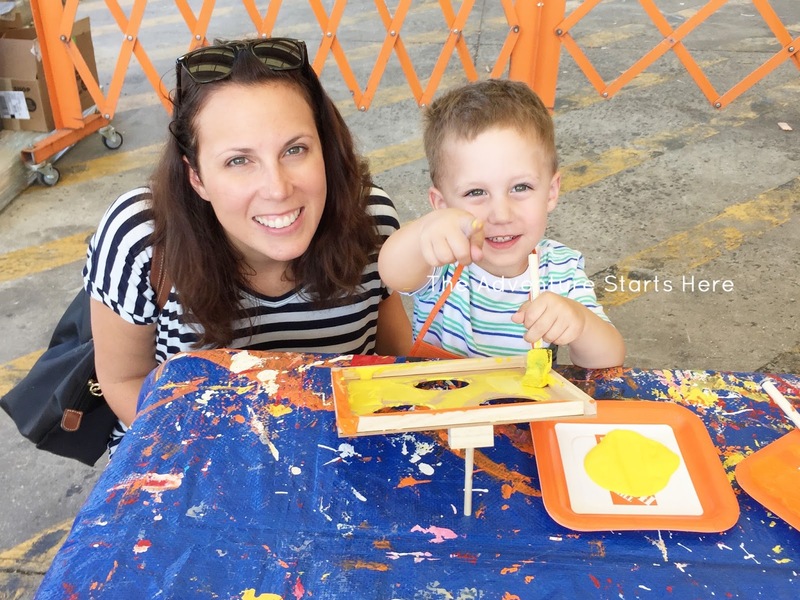 We are super excited for it since they will be making a fire truck and we heard a real fire truck will be visiting the store as well! Noah is gonna go crazy! WOW!!! The Home Depot ones look way more cool than the Lowe's ones! The Lowe's here (all of them in our area) fill up CRAZY fast so I always set a reminder to register. 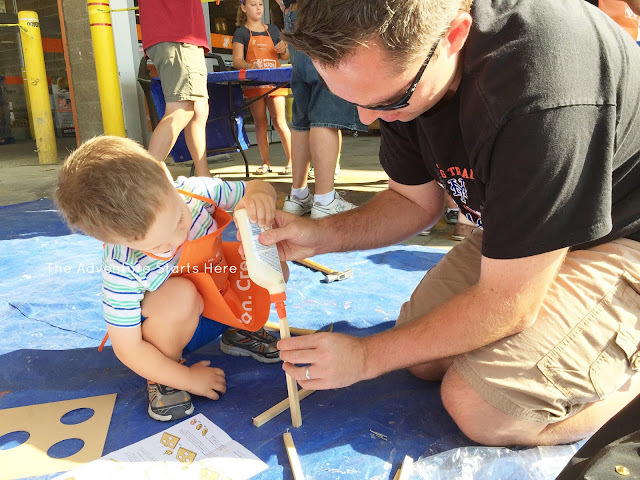 But Lowe's is only wood and stickers and you put them together with a hammer and nails. No glue or painting. These look way more fun!!! 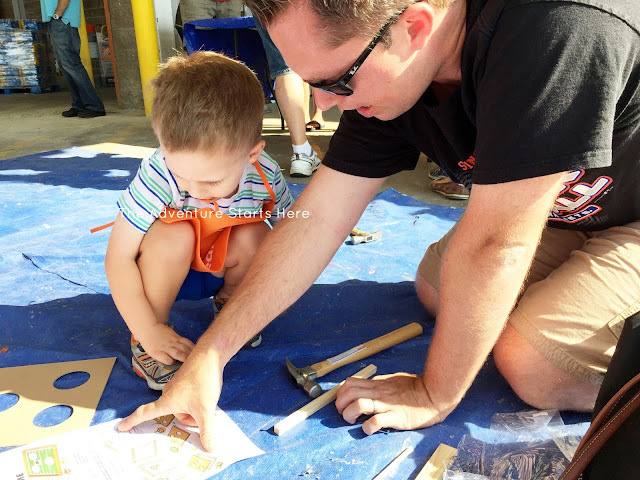 I've yet to sign up for a Home Depot one though because, like you, we seem to be busy EVERY first Saturday of the month! lol. I'll have to look again. This looks fun! 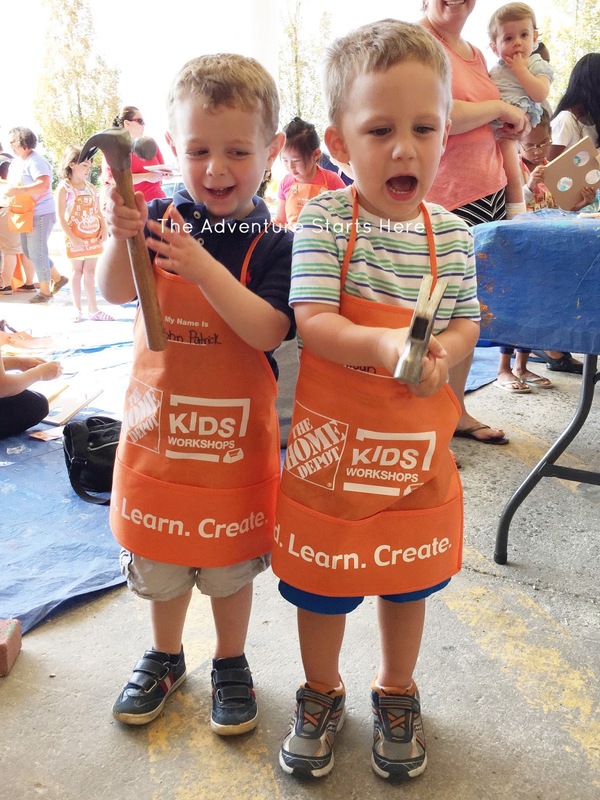 I forgot Home Depot offered these workshops! I would love to take Elin. 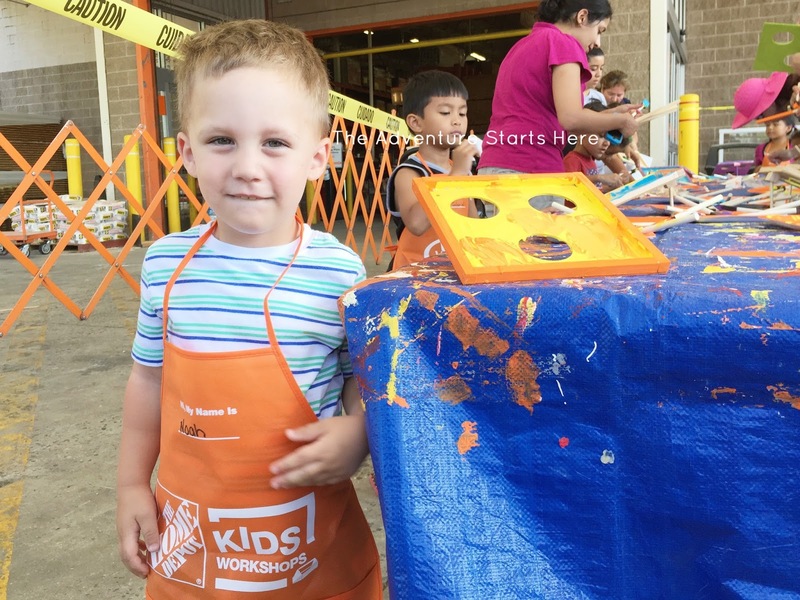 Looks like Noah had a blast! I just saw the fire truck one listed at my nearest store on their website but it says intended for kids 5-12. Wonder if it's ok to bring her?